BasquebyBike and Mendi Magaletan were founded in 2014 with the objective of showing the stunning Basque landscape and its ancient culture and promoting the MTB among the young people. Beñat Oronoz rode a bike for the first time one year after he was born. 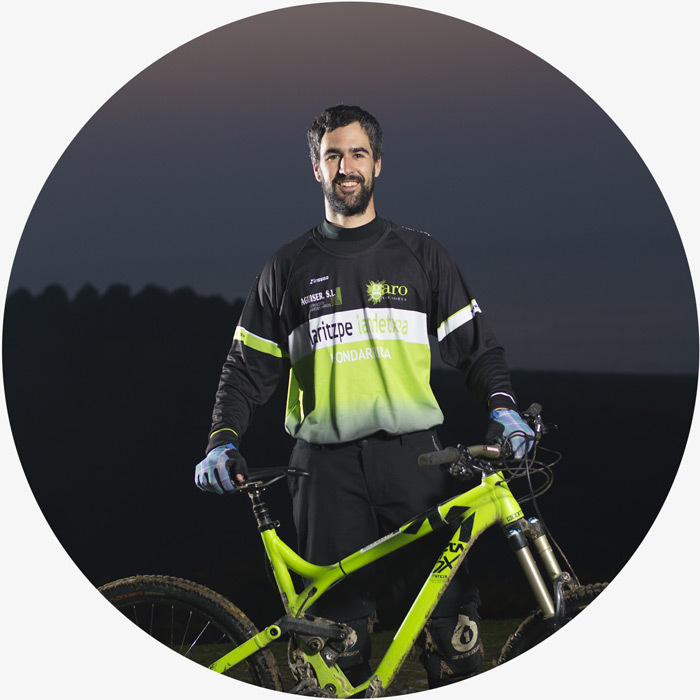 Since that he has tried a lot of different cycling disciplines but fell in love with downhill when he was a teenager and has had the opportunity to meet and share many days riding with the Basque DH pioneers. Over the last years he has been riding Enduro MTB, exploring every nook and cranny in the Basque Country to discover and build some of the best mountain bike trails. You can get a sensation of what we offer in our MTB Holidays section here. In our opinion every business has the function of contributing to the development of society. In our case, the main values that we want to transmit and are the basis of our existence are: the importance of the preservation of nature and the development of mountain biking in the Basque Country among young people. We think that the best way to make people appreciate and respect nature is bringing them to it. For this reason, from Basque by Bike we offer guided routes, lessons and camps. We offer these services mainly in Spring, Summer and Autumn. During the school year, we also work as an MTB school, Mendi Magaletan. From Mendi Magaletan we try to solve the dependency that young people have on their parents to do MTB. Therefore, in addition to the MTB school services, we also proudly support the Mendi Magaletan Enduro/DH Team. We put a lot of passion and excitement into this project and we always try to transmit that to everybody that comes to visit us.